How many of you know the interesting fact that Viking Princess is originally owned by high-end European yacht builder, Princess Yachts. The Viking partnered with them to bring these luxurious boats in US and named them Viking Sport Cruiser but later on they were named back Princess Yachts. 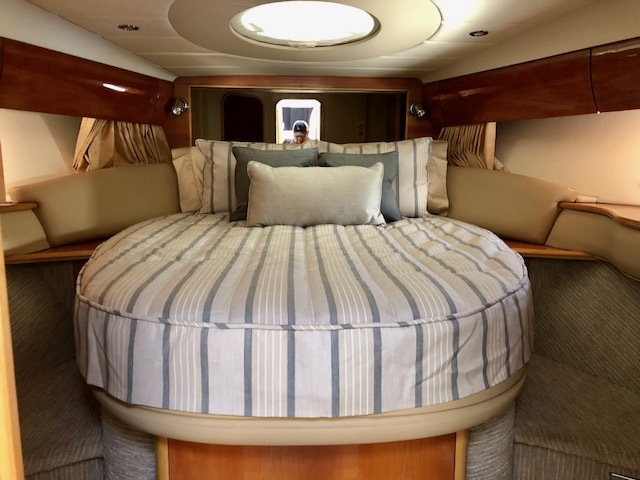 Main features are its spacious Flybridge, comfortable and roomy staterooms and not to forget the salon with sofas that can be transformed into a king bed. We did mattress and bedding for this Viking Princess 50. We make everything custom according to the size and shape of your specific boat. If you own a yacht, you know well the odd sizes and shapes of the beds and none of them are alike. That’s what we specialize in. All our mattresses, toppers and bedding are made specific to fit your particular bed. We can make any material you want for your mattress but we always recommend Latex to our customers because of its amazing qualities. Latex is extremely comfortable, breathable, bendable, mold and mildew resistant, it regulates body heat so you sleep cooler than warmer and it will not absorb smell. Our mattresses can differ in thickness and firmness according to the customer’s choice. Each boat mattress we make is crafted custom in California and built to stand up to rigors of a marine environment. For the bedding, we used our 600 thread count Egyptian Cotton sheets, Sunbrella coverlet, shams and throw pillow. Our customers love our custom sheets. The only reason because they fit incredibly well and the soft feel of Egyptian cotton helps you get that great night sleep on your bed. Not to forget, they wash really well! Here, the striped sunbrella coverlet with similar piping edge gives a true finishing touch to the bed. We carry a wide variety of house fabrics on our website and are always adding something new and exciting, so don’t forget to check out. If you are interested in Sunbrella, give us a call and will guide you to view those selections. 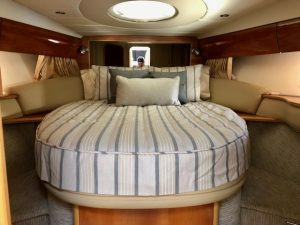 A comfortable mattress and classic bedding will make your stay on your yachts really relaxing and exciting. Our design team is always coming up with new ideas to freshen up your staterooms and make your nights restful on your boat.